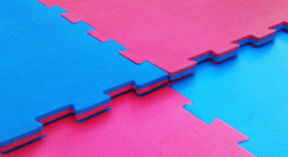 When choosing your interlocking jigsaw mats supplier it is import to find the right supplier. So the question here is why Ezy Mats? Well there are a number of reasons you should chose Ezy Mats when buying your EVA interlocking jigsaw mats or tatami mats. Dedicated Sales staff – At ezymats we have dedicated sales staff that know the products. Not only can they give you pricing but they can help in recommending which mats to buy. Delivery – We will always try to offer you the best delivery rate for you mats around. We use a number of freight companies so we can offer the best delivery price to you regional centre, town or city. Quality – We check all the mats that come in to ensure they are good quality. Customer Service – We are really nice people and endeavour to provide the best customer service in the industry. I am sure there are a thousand other reasons you should choose Ezy Mats. So for your next training mats order contact Ezy Mats. interlocking matsjigsaw matsWhy Ezy Mats?